Well...maybe not exactly for walking but definitely for altering! I got this cute turquoise shoe adhesive dispenser at the Scotch booth at the winter CHA and I knew immediately I'm going to alter it! It took awhile but I finally did it! 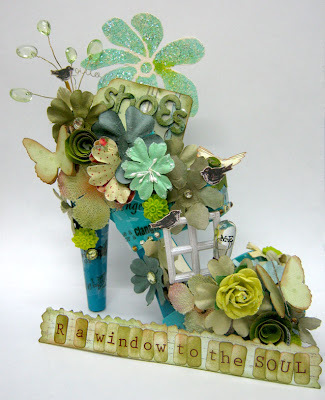 I first covered the shoe with a transparent tape to give the shoe a little pattern and then I added all kinds of Prima embellishments such as flowers and resin window. I also added the word SHOES on a tag I've attached to the shoe and completed the title on a strip of paper on the bottom of the shoe. It was such a fun crazy project to do...you should try it! It's glorious... but I've got to say I don't fancy walking in it!! Stunning, love the colours and all the goodies.